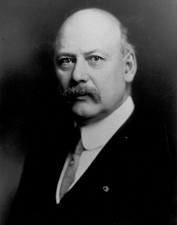 WEEKS, John Wingate, (father of Sinclair Weeks, great nephew of John Wingate Weeks), a Representative and a Senator from Massachusetts; born near Lancaster, N.H., April 11, 1860; attended the common schools; taught school; graduated from the United States Naval Academy, Annapolis, Md., in 1881; served in the United States Navy as a midshipman 1881-1883; resigned from the Navy in 1883 and took up the profession of civil engineering and surveying; relocated to Florida and served as first chief of the Orlando fire department 1885-1888; land commissioner of Florida Southern Railroad in Jacksonville 1886-1887; returning to Massachusetts, engaged in the banking and brokerage business in Boston 1888-1914; served in the Massachusetts Naval Brigade 1890-1900, acting as commander the last six years; moved to Newton, Mass., in 1893; member of the Board of Visitors to the United States Naval Academy in 1896; served in the Spanish-American War as a lieutenant in the Volunteer Navy 1898; member of the board of aldermen of Newton 1899-1902; mayor of Newton 1902-1903; elected as a Republican to the Fifty-ninth and to the four succeeding Congresses and served from March 4, 1905, until his resignation effective March 4, 1913, to become United States Senator; chairman, Committee on Expenditures in the Department of State (Fifty-ninth and Sixtieth Congresses), Committee on Post Office and Post Roads (Sixty-first Congress); elected as a Republican to the United States Senate and served from March 4, 1913, to March 3, 1919; unsuccessful candidate for reelection in 1918; chairman, Committee on the Disposition of Useless Executive Papers (Sixty-fifth Congress); appointed Secretary of War by President Warren G. Harding in 1921, and again by President Calvin Coolidge, and served until 1925, when he resigned due to ill health; died in Lancaster, N.H., July 12, 1926; remains were cremated and the ashes interred in Arlington National Cemetery, Arlington, Va. Dictionary of American Biography; Spence, Benjamin. The National Career of John Wingate Weeks (1904-1925). Ph.D. dissertation, University of Wisconsin, 1971; Washburn, Charles. Life of John W. Weeks. Boston: Houghton Mifflin Co., 1928.